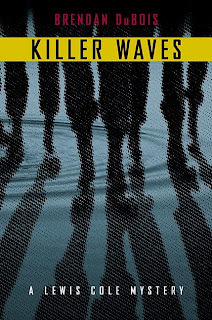 Killer Waves is the fourth novel in the Lewis Cole mystery series by New Hampshire native Brendan DuBois. Its premise comes from an article DuBois saw in the Boston Globe a few years ago about a German submarine brought to Portsmouth Naval Shipyard at the end of World War II containing uranium for a nuclear bomb. The uranium was unloaded from the sub and hasn't been seen since. Lewis is a former Department of Defense research analyst who lives in Tyler Beach, N.H., and writes for magazines. He tries daily to forget about his time with the DOD. His house, job, and paycheck are courtesy of the government in exchange for his silence about what he experienced in the desert a few years ago. Lewis was the only survivor of a secret mission that went horribly wrong. As Killer Waves begins, he is out on his deck overlooking the Atlantic Ocean at 1 a.m. The space shuttle Endeavour has just lifted off from Florida and he sees it through his binoculars. Lewis is about to head back to bed when he notices flashing lights at a park next to his house. Curious, he walks over and finds police officers and EMTs standing near a single car. There is a dead man in the car, apparently shot in the head. Soon three dark LTDs arrive carrying five men and a woman who takes control of the scene. Lewis is happy enough to leave, but is curious as to who these people are and why they won't identify themselves. He has a nagging feeling they are federal agents but ignores it because he doesn't want his bad memories of the DOD to surface. Unfortunately for Lewis, life isn't that simple, and he is drawn into the work of a federal agent kicking and protesting, because the government makes him an offer he cannot refuse. The first three Lewis Cole novels are less cloak-and-daggery than Killer Waves. In the earlier books Lewis pursued cases based on his own need to see justice served. In Killer Waves, government agents lie and use any means to get their jobs done, including forcing Lewis to do investigative work. The storyline itself seems a bit far-fetched, but it kept my interest because of its basis in New Hampshire's history. It's a great mystery, with many plot twists and red herrings, if the secondary story of new management at the local newspaper wanting tabloid stories instead of real reporting doesn't sidetrack the reader. Lewis Cole novels are set in fictional Wentworth County, which is based on New Hampshire's Rockingham County. Towns outside the county are real: Manchester, Boston, Concord, Portland. Readers will find Tyler Beach similar to Hampton Beach. Fictional Samson's Point resembles Rye's Odiorne Point. But don't drive up and down Route 1-A looking for Lewis Cole's house. It doesn't exist. I enjoyed the first three Lewis Cole mysteries much more than the fourth, but I like all of them because of their setting. The fifth Lewis Cole novel, Buried Dreams, is expected next summer. His third suspense-thriller novel, Betrayed, is due out next spring.